Malls don't have to die. Here comes a parking lot full of Uber drivers next to the former Sears (SHLD . "The growth of e-commerce and the increasing emphasis on delivery speed as well as pick-up services for retail goods will likely precipitate a convergence of industrial distribution and retail real estate," Fitch said in a note on Tuesday. Fitch essentially predicts that well-located malls - calculated by their proximity to population density plus the per capita income of that region - will prosper in the future as distribution and pickup centers for e-commerce retailers like Amazon (AMZN - Get Report) , the giant online corporation which saw its stock hit a record $1,000 a share on Tuesday, rather than shopping destinations. "Owners of infill retail locations that can also function as delivery and pickup locations will likely be winners as this convergence accelerates," Fitch analysts said. "'Location, location, location' applies, possibly now more than ever." And, with excess parking facilities, Fitch said some mall real estate investment trusts, REITs, are already considering how they will transform the space into hubs for Uber drivers and self-driving cars to carry out the delivery services. 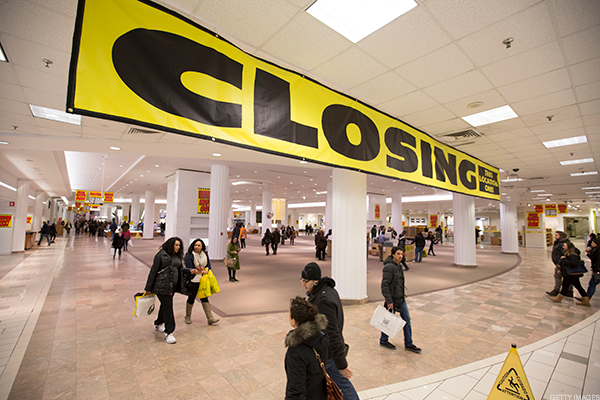 With anchor stores such as Macy's (M - Get Report) , J.C. Penney (JCP - Get Report) , and Sears continuing to close stores in droves, and leaving mall owners struggling to drive foot traffic, it's hard not to imagine Fitch's prediction coming true very soon. Editor's Pick: Originally published May 30.